This week’s album review is taking longer than I expected, so here is the For a Song feature in the meantime. Everyone, or at least the vast majority of my readers, surely is familiar with the songs of Joni Mitchell. But far fewer people realize that the later part of her career has continued to yield great songs. Yes, her albums become more uneven as you go on, but the best songs are still as good as any of the early work for which she is so much better known. I love the early songs as much as anyone, and I will feature them here from time to time. But I also want to shine a light on some of the lesser known later songs. Otis and Marlena is a case in point. Hejira is probably the last album Mitchell’s old fans embrace. They accept this one adventure of Mitchell’s, playing electric guitar, so that they can lay claim to songs like Amelia and Coyote. But Mitchell followed that up with Don Juan’s Reckless Daughter. In retrospect, this was as poor a career move as Mitchell could have made. At the time, vinyl was still the dominant format for music, and Don Juan was a double album, correspondingly expensive. The second disc was dominated by two songs which had only Mitchell’s voice and a percussion ensemble. Within ten years, African music would start to make inroads with American audiences, but Mitchell was early, and audiences did not want to pay for two extra sides of vinyl to have these strange songs. So they missed out on the rest of the album, including Otis and Marlena. 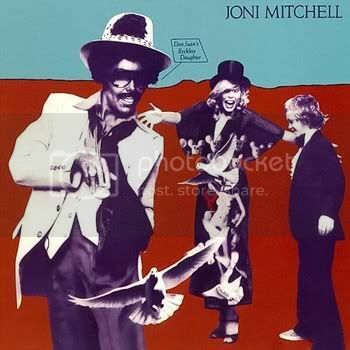 Ironically, the sound of this one is something of a throwback to Joni’s early sound, with an arrangement dominated by acoustic guitar and Mitchell’s voice. The tone of the lyrics is another matter. Mitchell presents a couple who are vacationing in Miami, observing other people and the artificial ways they have tried to hold off the aging process. The chorus, in just a few words, emphasizes the triviality of all this. “While the Muslims stick up Washington” probably refers to incident that occurred nine months prior to the release of Don Juan’s Reckless Daughter, when a band of militant Muslims briefly took over the B’Nai Brith International Center in Washington DC, taking hostages and demanding the release of some of the members of their group who were in prison at the time. This incident is only referred to in the one line, and Mitchell assumes that her listeners would get the reference. Her focus though, is on the contrast with what Otis and Marlena observe. This is not a song that a younger Joni Mitchell would have written, and, as hard as it would have been to imagine at the time, a key reference has lost the resonance it held at the time. But Otis and Marlena is still a fine piece of writing, and the performance is vintage Joni Mitchell. This is a great album, no doubt. I find it odd, though, that it's described here as being from Mitchell's "''later" period, as it falls right in the middle of her career. There were eight albums of all-original material before this one, and there have been eight since (this excludes compilations, orchestral re-workings, etc). Also, I strongly question the assertion that this was a bad "career move." Perhaps for an "artist" like Rihanna, or even Madonna, one can link smart career choices to moving units. But for Joni, the career is one of making art, not producing fodder for commerce. This is the album that prompted Charles Mingus to request that Joni collaborate with him on a new project. Mitchell's career and life has been about exploration, that's what makes her Joni Mitchell. My use of the term "later" here does not divide Mitchell's career by album count, or by years. I divide her career into the "early" period which made her reputation as the queen of confessional singer-songwriters, from her debut album through Court and Spark, and the later period when Mitchell deicded to make a break from the confessional mode and write songs that were in the third person, and that were clearly not about her. This started with The Hissing of Summer Lawns, and continues to this day. As to its merits as a career move, you are right that Mitchell has never concerned herself about this, and continues to blaze her own trail, without regard to commercial considerations. Like you, I applaud her for this, and I celebrate the artistry of this "late period" with this post and others.